The teamtechnik Group, international market leader in the stringer technology segment, presents its STRINGER TT1200 HS at Intersolar 2013 in Munich. 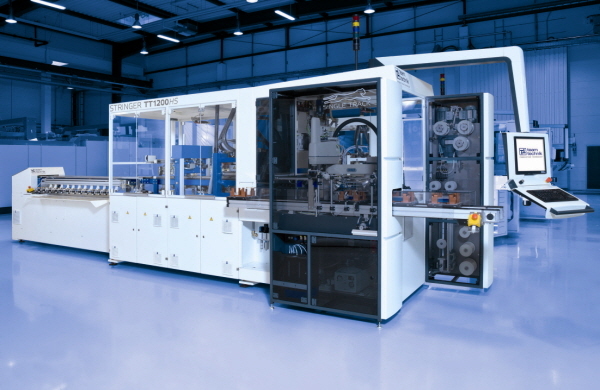 The high throughput system solders solar cell strings in a 2.5 second cycle on just one track. It thus outpaces its predecessor by 200 cycles and is currently the fastest single-track stringer system on the global market. A single track means one single soldering process per stringer, less complexity, a lower requirement for replacement parts and fewer operators. April 30, 2013 – With a proven availability at over 95%, the system ensures stable production 24 hours a day, seven days a week. "Our competitors machines only achieve the per-formance of STRINGER TT1200 HS with two tracks. We are offering our custom-ers a solution which is currently unique and successful on the market in terms of speed, availability and breakage rates," says Stefan Rosskopf, CEO of the team-technik Group. teamtechnik uses a unique design of hold-down device in its systems to separate the actual soldering process from the cell-handling process. This allows teamtechnik to ensure 1400 cycles/hour, with a cycle time of 2.5 seconds with just one track. This hold-down device also ensures a safe process and perfect string geometry. At the same time, it guarantees extremely low breakage rates – from 0.1-0.3%, de-pending on the type of cell. 9 GWp, and is therefore market leader in China as well as worldwide. The company guarantees its customers 24-hour support anywhere in the world. "We can build one machine every day. None of our competitors can achieve this. We can deliver quickly and at an excellent price-performance ratio," says Stefan Rosskopf, elabo-rating on the customer-oriented service offered by teamtechnik. The distinguishing feature of the STRINGER TT 1200 HS is its modular and stan-dardized structure. This makes it possible to adapt new cell technologies to the system which has become widely established throughout the world. teamtechnik specialists have successfully tested and optimized BC, MWT, 4-busbar and half-cells plus adhesive technologies in the companys own center of competence and brought them into series production. The first systems have already been shipped. The center of competence finds the best soldering and connection options for stan-dard and special cells and optimizes them further – a service much appreciated by customers worldwide. Based in Freiberg/Germany, teamtechnik has been making intelligent and reliable automation solutions for the medical and solar technology and automotive sectors for over 35 years. teamtechnik is considered an international leader in highly flexible automation technology. The company has specialized in high-throughput stringer machines for the global photovoltaic industry and is market leader with a capacity of 9 GWp worldwide. teamtechnik high-performance production tools are designed to combine reliable large-scale series production with unexcelled levels of string quality. The senior management team has set a sales target of €145 million for the current business year. The company employs 800 people around the world. The majority of the workforce are engineers and highly qualified specialists. The teamtechnik Group has production sites in Germany, Poland, China and the USA.